Are you ready for Derby Day? Derby Day is on its way, and we at The Warren couldn’t be more excited. We’ve been practicing our mint julep techniques and I for one, have a truly epic hat. 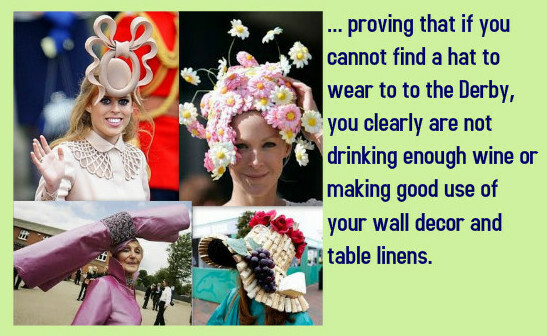 You better bring your A- Game Atlanta, because the most fabulous hat wearer will win a select bottle of wine from The Warren cellars. We aren’t leaving the prizes just for the boldly festooned, though. We’re having a drawing of the horses for everyone that comes out to celebrate with us. The winner will receive Warren Prize Money to be spent on the spot or at a later date. Really know your horses? Pick the trifecta and win a FREE Full Warren membership, valued at $600. We take our horse racing seriously here at The Warren, don’t let the banana on my head fool you. So come on out Atlanta. We’ll scream. We’ll shout. We may even watch a race or two. 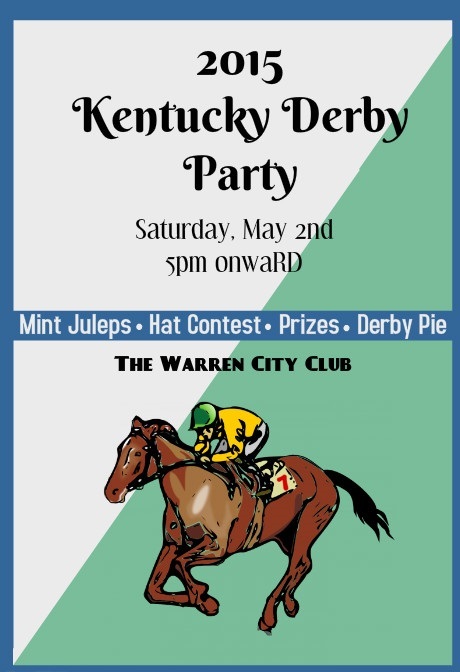 The Warren City Club is the place to be this Derby Day. Hope to see you there. Saturday, May 2nd, 2015 will witness the 141st running of the Kentucky Derby at Churchill Downs in Louisville, Kentucky and The Warren City Club has your front row seat. Join us for our famous and fabulous Kentucky Derby Party complete with prizes, traditions and air conditioning. We will of course have Mint Juleps and Derby Pie accompanied by lots of prize winning opportunities. Upon arrival, you will draw for the name of the horse will be “betting” on. All winner will be given Warren prize Money to spend then or later. A Full Membership ($600 value) will be given to anyone who accurately predicts the 1st, 2nd and 3rd place winners. 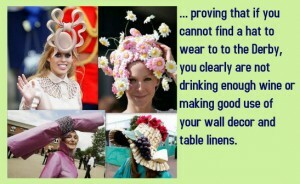 Finally, the winner of Best Hat will receive a bottle of wine, which they may drink or where next year as a hat. When Ron White comes back to The Warren, we will be ready for him with our new addition of Johnnie Walker Blue! We brought in this item at the request of a few Members, but have decided to introduce even more folks to it’s deliciousness by lowering the price below anything you can find in Atlanta, and maybe the world. 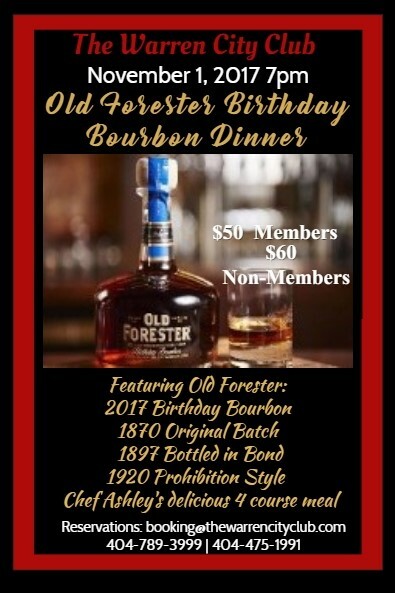 We are offering this, normally $45 to $65/shot Blended Scotch Whisky, for $25!!!! 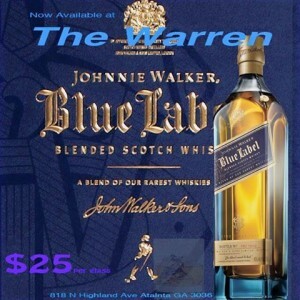 That’s right Johnnie Walker Blue below market prices at $25/shot! We are also pairing it or Macallan 18 with a Grilled Tenderloin, Salad and Side for a $50 Scotch & Steak Dinner Special any Wednesday – Saturday from 6 to 10 pm. one of the most expensive, blended scotches on the market – unless you purchase it at The Warren! JW Blue’s deep amber color lures you into it’s aroma of butter roasted nuts, artisan cocoa, dates, and delicate brown spices. On the palate, a soft, plush entry leads to a dry-yet-fruity medium-full body of rich chocolate covered fruit and nuts, honeyed rye toast, and vibrant peppery spice. The finish brings to mind warm chocolate pecan pie, mossy wet stone, and fades into mild pink peppercorn. Nice subtle layers of flavor make this an excellent choice for after dinner sipping. Join us for a Johnnie Walker Warren City Club experience!